This article isn’t really an “article.” It’s the text of an email — one we received third-hand via Cyrus’s friend Abby, who forwarded it to Andy, our co-founder. His story was too incredible not to share, and we do so with Cyrus’s blessing. – Ed. While my uric acid (gout) was in control (with medications), the rest of my blood work sent me into a mild panic. My blood sugar was over 200. My HA1C was high. My ketones were elevated. All indications of diabetes. I do have a family history of diabetes — but hearing that word at a doctor visit is traumatizing. In addition, my other numbers were even more alarming, indicating significant inflammation in the body, severely fatty liver, and more. I was spiraling without even knowing it. Work was busy, I ate whatever, whenever, and there was no control. I gave myself excuses: kids, work is busy and doing well, coaching soccer, etc. Always a reason to pick up a cookie, not an apple. To eat fast food, not cook. That weekend after I got the blood work, I reached out to my primary care provider to ask him what he thought. He said to come in soon to discuss. That Sunday night, I was awake late as usual. At about 12:30am, I recalled a buddy at work who said he and his wife had done the Whole Life Challenge with a lot of success. I needed help. Years of trying on my own had led to years of my weight yoyo-ing. Fifteen pounds down. Twenty up. Twenty down. Thirty up. Yoyo-ing makes you think your changes are equal up and down, but they’re not. They’re more up than down — badly so. I have two small boys, and I started thinking about all the things I couldn’t do now and how bad that would continue to get over time. As a relatively athletic guy over the years who had previously been a total gym rat, I had atrophied to the point where I hardly recognized myself. I hadn’t realized all that I’d lost — working out, running, basketball, so much. So, at 12:30am, I signed up. I gave up the best fifty dollars I have probably ever spent. I downloaded the nutrition guidelines, knew nothing, and told myself I had to fix things. No “cheats,” no weekends off, no moderation, no exceptions. My wife, Dita, said she’d support me in any way she could. My doctor told me I could redo the blood work before Thanksgiving and he would see me for an emergency visit to review the updated numbers. I was determined to fix my situation. Out of fear. Fear, arguably, for my life. I started that Monday. The Challenge had already begun a few days earlier, but I made up my mind that I would keep going through the week before Thanksgiving to make up the time. The usual water weight fell off quickly. Everything was new and exciting, and I dropped over ten pounds in the first couple weeks with ease. I had headaches and body aches. I was cranky, tired, and hated it. Then about four or five days in, I started to uptick my activity, moving past fifteen to twenty-minute walks to actual gym workouts. I loved the stretching component of the Challenge and some of the weekly activities were great and inspiring. I went from fear to hope and ambition. My mind was stronger by the day. I didn’t eat a piece of candy at Halloween. I didn’t eat cake or pizza at my son’s fifth birthday party. I skipped a fall full of football Saturdays and Sundays filled with crap food. And, I didn’t care. Then I started getting excited about where this could take me. I was hopeful for a twenty-pound loss in the six-week cycle. I hit 22. I had lots of frustrating plateaus, especially when my exercise up-ticked heavily. I put on muscle quickly, and with working out you retain some water as your muscles swell a bit. All of that has an impact on the daily weigh in. But what might have caused me to quit before, forced me to be even more resolute. It wasn’t about three days of weight. It was about years of neglect. So, if my weight ticked up, I got angry, and then moved on. But there was no quitting. No diet soda, no bread, no cheese —all doable. The biggest struggle was the battle with sugar. You have no idea how much added sugar is in things until you look. Sugar is in everything and in so many fake and natural forms. From sausage, to salad dressings, to every prepared food under the sun. It was eye opening. What I loved is that I had no actual food limits. Restrictions, yes, but nobody hounding me about tiny portions. Eat veggies. Eat fruit. Eat rice. Eat corn. Eat fat. Eat nuts. Eat all sorts of things. I didn’t feel trapped. I put my own restrictions. My one point-loss on nutrition was when I suspected an Italian vinaigrette to have some extra stuff (not because I splurged on something) And that made me angry. What did I learn? Prepare, prepare, prepare. Some small things at first. You get excited when clothes fit better and your wardrobe expands (it did significantly). My sock lines on my legs after work were gone. After months of seeing indents in my skin, there was nothing. No discomfort, nothing. After months of crappy sleep — snoring my way to another bad meal at McDonald’s on the way to work — my sleep quality improved. Not a little. A lot. And I was happy to hear my snoring was much less. Previously, I had been waking up with my eyes droopy, sore, and tired. It took me time to feel awake. Usually the result of grabbing warm breakfast sandwiches that felt great for thirty seconds before they put me into a food coma for half the morning. It’s the little things in life you remember. I remember in late September, I was buying a bag of chips, and a guy at work said, “You eat more chips than anyone I’ve ever seen.” Funny how that sticks with you when you cut chips out and realize what he said was probably true. I put on jeans that hadn’t fit in years. I wore all the t-shirts in my drawer. I used to have a rotation of about eight. Now I can wear all thirty! I didn’t even believe it until I put them on. I’m not skinny or anything, and never have been. But, in the past, I’d always had a strong build with some definition. When I started the Challenge, the only thing defined was my laziness and my growing weight and health problems. On November 15, I went to the doctor for my annual physical. He was surprised and shocked by what he saw. My blood sugar went down to 91. Normal. My inflammation numbers? Normal. My fatty liver enzymes and other liver measures? Almost back to a normal range after being elevated for years. I started the Challenge at 296lbs (though I had peaked in the twelve to eighteen months prior at about 310). I finished on November 15 at 274 pounds. My doctor was amazed at what I accomplished. When I told him I was hoping to learn to “maintain” over the holidays, and then would be doing the Challenge again in January, he told me he was excited to see what would happen after my next scheduled blood work in March. I had added years back to my life. My diabetic state had been reversed. I haven’t been in the 260-pound weight range in years. I haven’t been in the 250s since my wedding. Going to the beach was embarrassing. Trying to run felt like knives in my joints. When I was around 250, I was strong, fast, muscular and active. That was pre-kids. That was pre-marriage. But still higher than my peak physical condition, around 225. My fear turned to hope. The hope turned to determination. The determination turned to inspiration. The inspiration hit me square in the face. When we were on our honeymoon to Maui, my wife and I wanted to go zip-lining in the jungle. There was a 250lb weight limit. I was worried I wouldn’t make it, and to avoid embarrassment, we didn’t go at all. I was disappointed in myself, but also disappointed for Dita. My weight had never limited me in anything before. It did then — and I responded by spending nearly ten years gaining another fifty-plus pounds. During the Challenge, I found a good supportive team of two — a couple who were going on their own journeys. But this was about me. I was probably not as active a teammate as I’d like to have been, but I needed to focus on improving myself, and be supportive when I could. I didn’t need their support. I had no weak points. All I needed was to look my kids in the face to realize I never wanted to lose that. I have friends and a wife who plan to join me for the upcoming January Challenge. Honestly, as much as I love the holidays — and I love food, both cooking and eating it — I cannot wait to fully start up again on January 19. I can’t wait to see what I can do. And, honestly, it’s all because of the Whole Life Challenge. I know food. I know nutrition. I know exercise. I know plenty. Doing was my problem. This program inspired me to do. Seven points of measurement (the 7 Daily Habits) helped me to avoid over-focus on food and to remember to keep busy with all the other aspects of transforming my whole life. I hope this sticks, and I hope my inspiration and motivations never slow down — I’m excited for all that the future holds. With a supportive wife and friends, I’m confident I can. 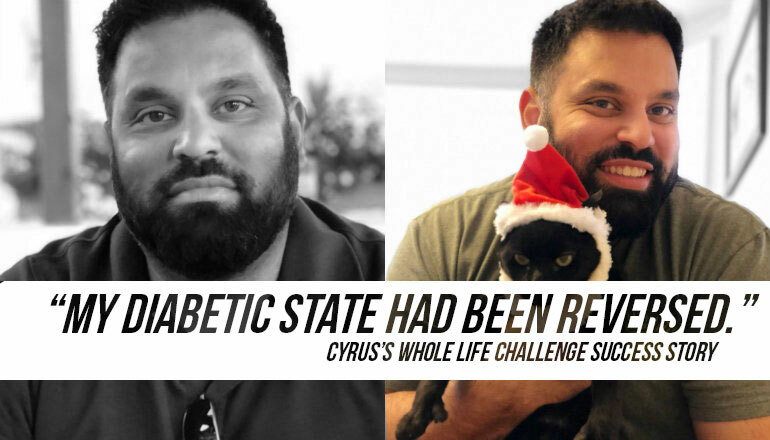 Cyrus is an active Challenge participant from Virginia, returning for his second Whole Life Challenge in January 2019.